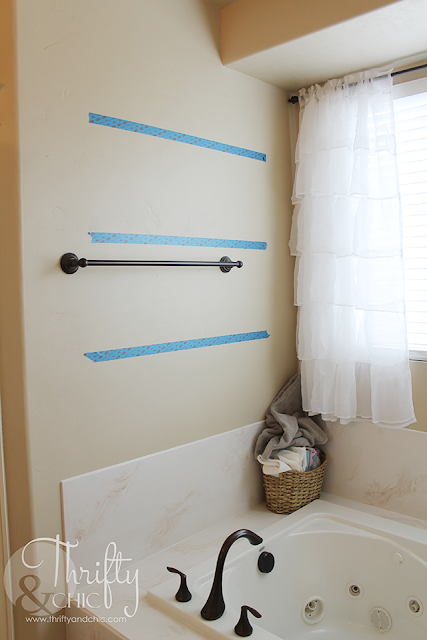 There once was a time that my bathroom looked like this. Well, truthfully, I did have towels hanging on the rod, so it wasn't that bad :) But the toys and the random other-ness is a down play. 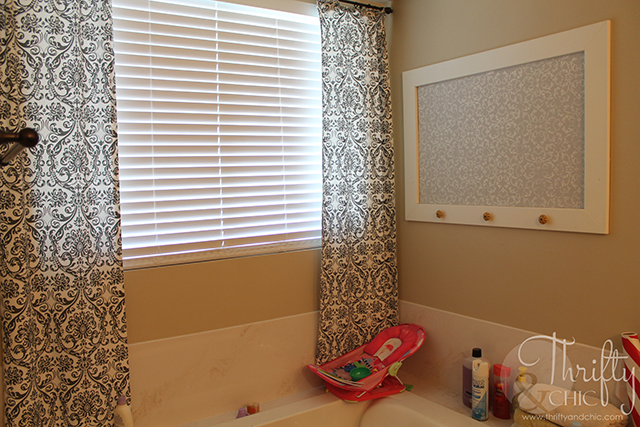 In fact, for about a month, we had a huge dresser standing right in front of this tub, so this is an obvious step up haha. 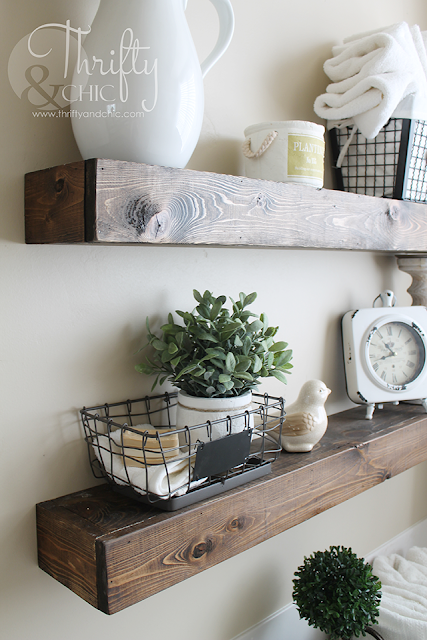 To create the actual floating shelves, here's how I did it. 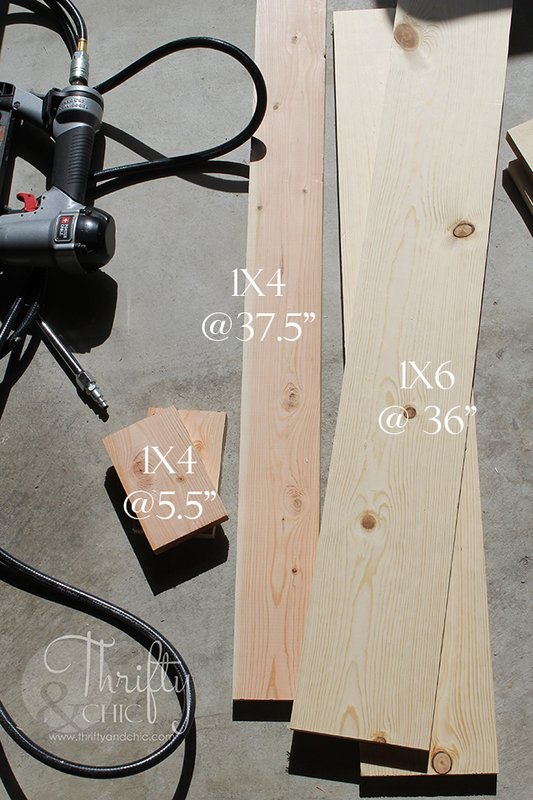 Step one is to put the 5.5" inch pieces on the ends of the 36" 1x6. Glue and nail in place. 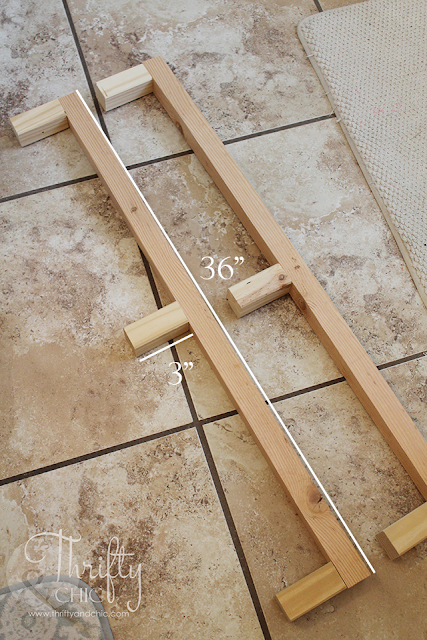 Then add the second 36" 1x6 piece to the opposite edge of the 5.5" pieces. Glue and nail in place. I then placed them on the wall, making sure they were level and even. Before staining, I sanded the shelves to smooth out the edges and corners. After staining the shelf with Minwax Dark Walnut, I then just slid them on to the supports. The fit was perfect and snug! I then realized after putting weight on these, I needed to add more support by adding a 1 1/2" screw into the top of the shelf into the support. I drilled this out first, and then sent the screw through. 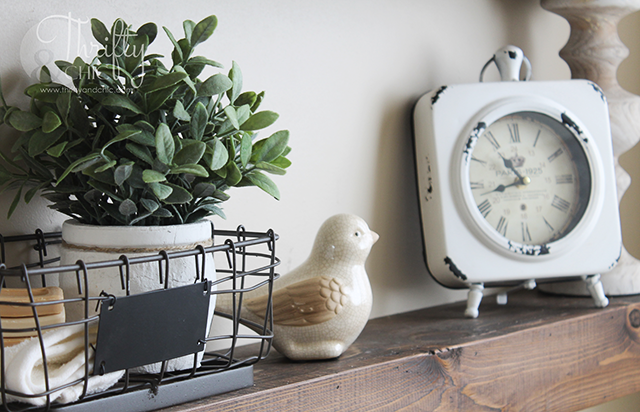 Although baths are meant for relaxation and getting away from things, I am such a time oriented person, so I had to add a clock :) I got this clock from Gordmans and the candle pillar from Hobby Lobby. I just love how this all came together! And of course, there was the problem with towels. 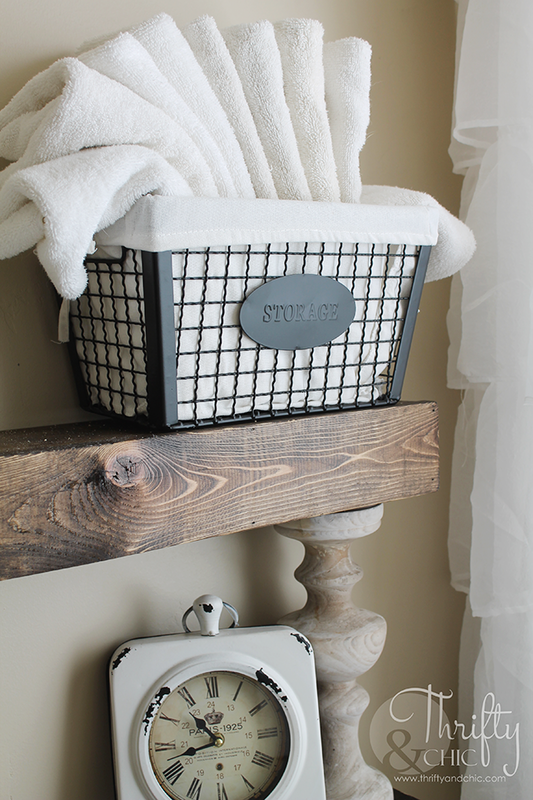 I was wanting to put them on the shelves, but I was bad and didn't realize my folded towels measured more than 6" :) So, if you are making these shelves to hold towels, use a 1x10! 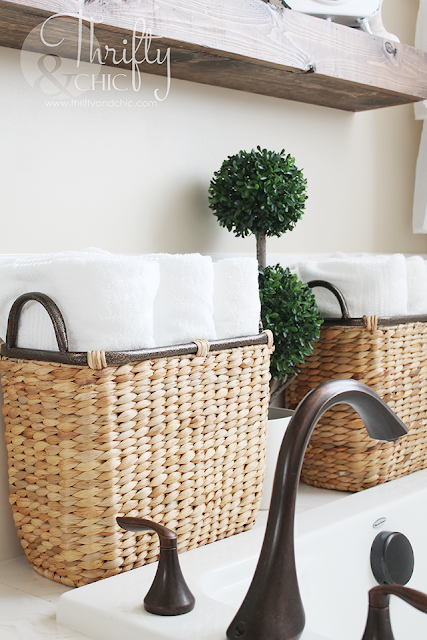 But, I was pretty happy when I found these baskets that fit all the towels perfectly! I actually like the whole look of the space because of these. As for the other wall? This was the before of this wall. I painted this square a few years ago and had the knobs to hang lanterns or towels, but it was also just a little boring. cute.very cute. wish I had your ambition. 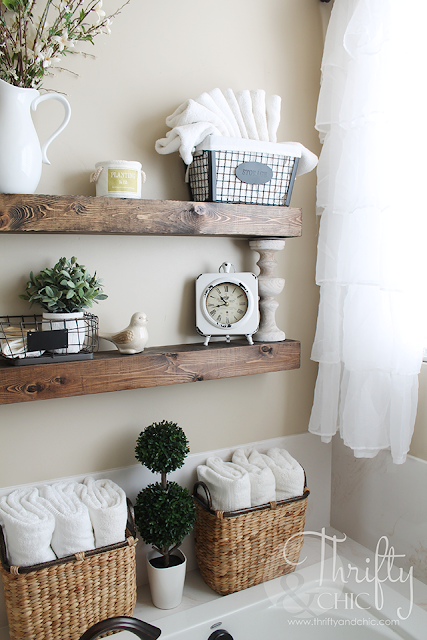 Floating shelves for confined bathroom is a big yes. Loved your insightful tutorial. 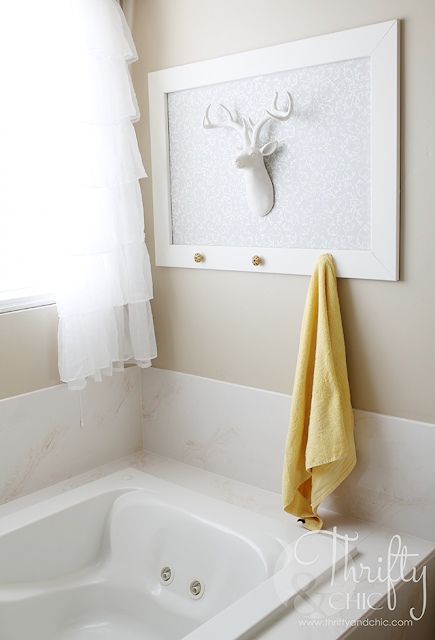 And, this little bathroom is looking really pretty. 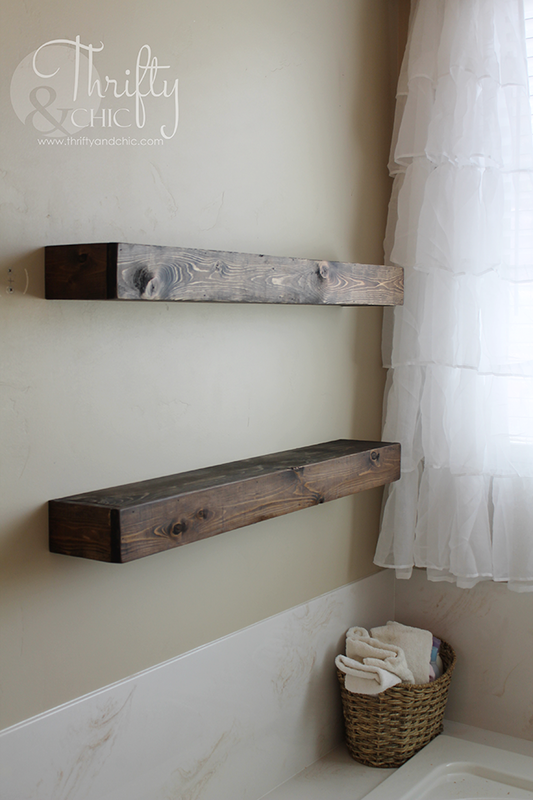 These shelves are amazing!! I am currently in the middle of creating a floating mantle in my living room! Excited to share it when it is complete. 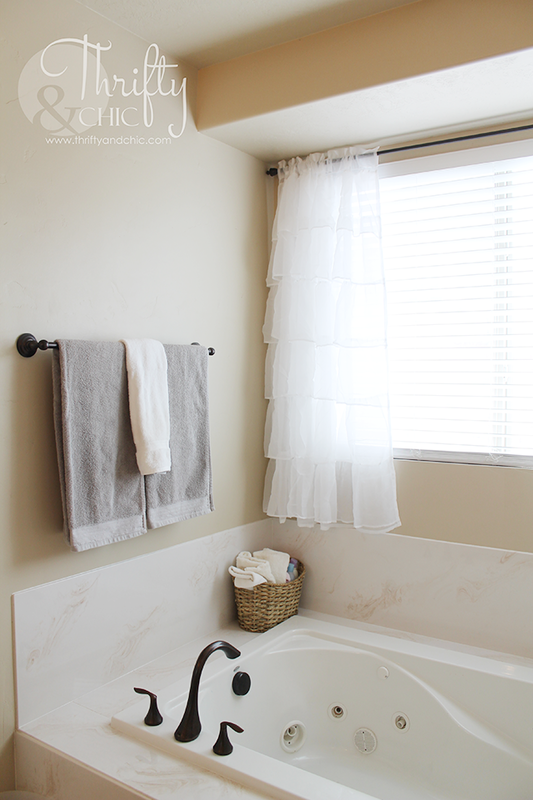 This is exactly what I want to do in my bathroom! Thank you for the great instructions. Your arrangement looks fantastic! Are they attached to the wall with a screw? I had to go back and look too. If you read through the steps she explains it but it isn't pictured. It is the piece that caps the shelf. I love the color of the walls in your after pictures. 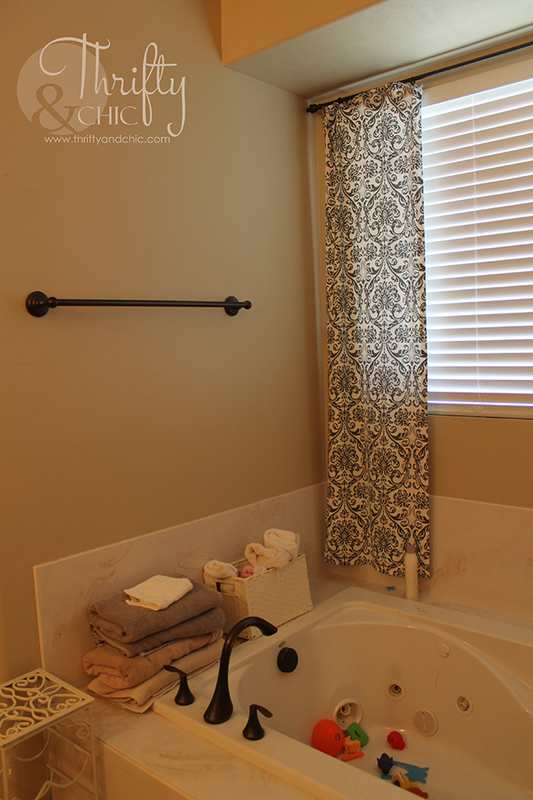 What is the paint color you used? Thanks! Unfortunately I don't think the shelves on the wall are the same ones in the tutorial pictures. In the tutorial it shows that you should place the end pieces on the ends of the front board. If these were the same shelves then in the finished picture you would see the end on the side pieces looking at it from the front. Doesn't look like it's the same. Hi Carrie, I assure you these are the same. I'll go through the tutorial and hopefully better explain the process. The front piece is longer than the side pieces. I don't have that pictured, sorry I guess it's been causing a lot of confusion. 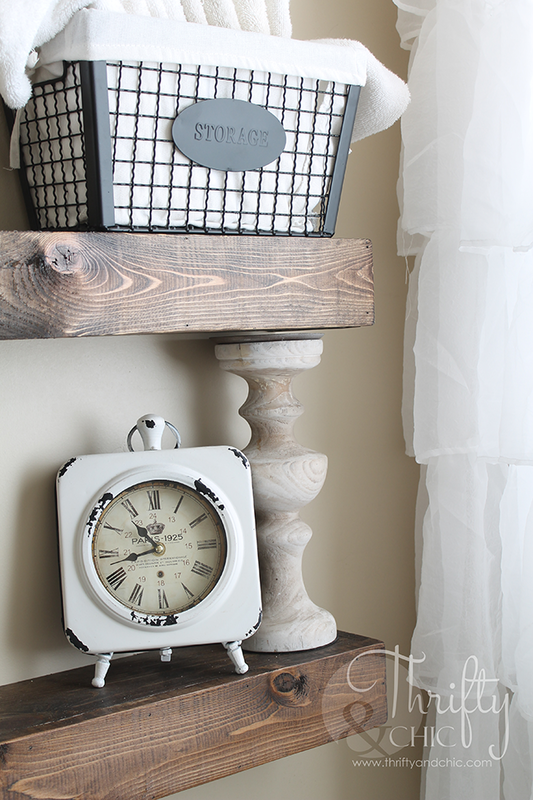 But if you look at the finished piece compared to the last picture of the shelf, you can see how the front piece fits. Hopefully to clear up the confusion, the front piece is the longest piece you should have cut and fits over the "box" you created with the top, bottom, and side pieces. Ahh, I see how it works now. So sorry! I wasn't able to make that work in my head. They are beautiful shelves. Thank you for sharing! I just love the transformation. So inviting and cozy. Are the baskets holding the towels the ones from Gordmans? Did you use pine or common board? love this! what is the depth of the shelves? 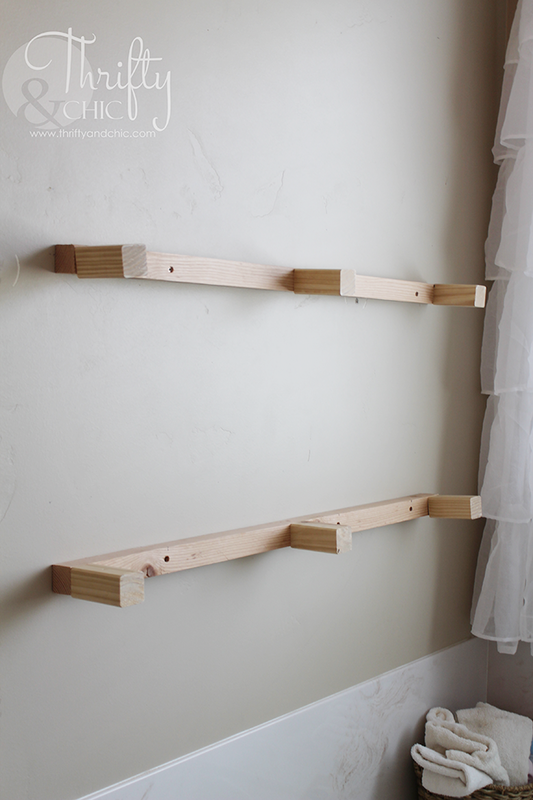 What height is the first shelf hung and then what is the distance between the two? What a great tutorial! The only question I have is she you said you needed one last screw for sturdiness after you started placing things on the shelfs, I can't not quite figure out where that screw went? :) thank you! 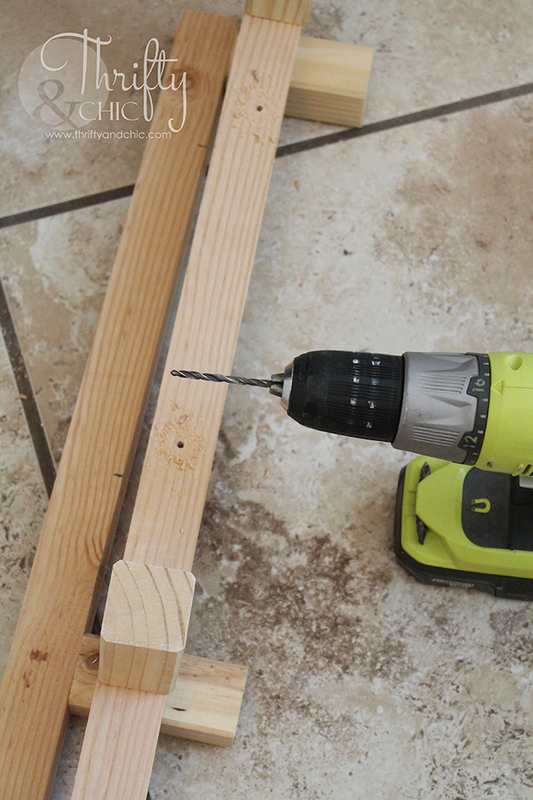 I put the screw on the middle top of the shelf into the back 2x2 wall support. So like half an inch from the wall. Hi! I have the same question about that "extra" screw for sturdiness. 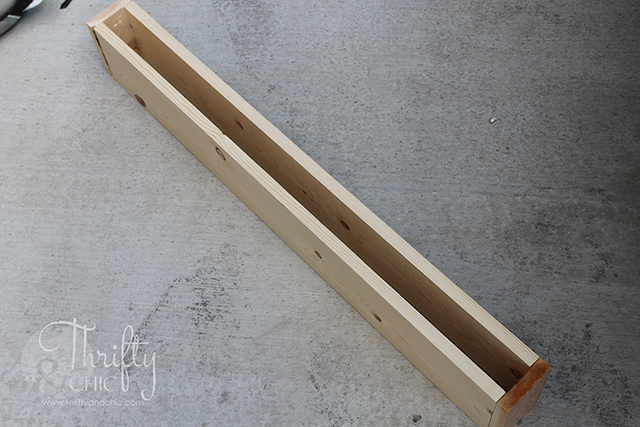 I am planning to use this tutorial to make one 6 foot shelf and two 3 foot shelves for my living room. I can't quite figure out where that extra screw should go on them. Thanks so much for the inspiration and tutorial. I can't wait to see how mine turn out. I have the wood cut and ready to assemble, but I'm running into a problem as I lay it all out to make sure I have everything. There's a 1/2 inch gap between the 5.5 inch side pieces attach to the front piece. What should fill in that space. The side pieces or 5.5 inches but the board is 6 inches wide. I'm sure I'm missing something. :) Any advice? Thanks for sharing the tutorial. The shelves are beautiful! I have the wood cut and ready to assemble, but I'm running into a problem as I lay it all out to make sure I have everything. There's a 1/2 inch gap between the 5.5 inch side pieces that attach to the front piece. What should fill in that space? The side pieces are 5.5 inches but the board is 6 inches wide. I'm sure I'm missing something. :) Any advice? Thanks for sharing the tutorial. The shelves are beautiful! Hi there, did you figure this out? I'd like to make these but it seems like there is a problem with the measurements. What size screws did you use? And drill bit size? 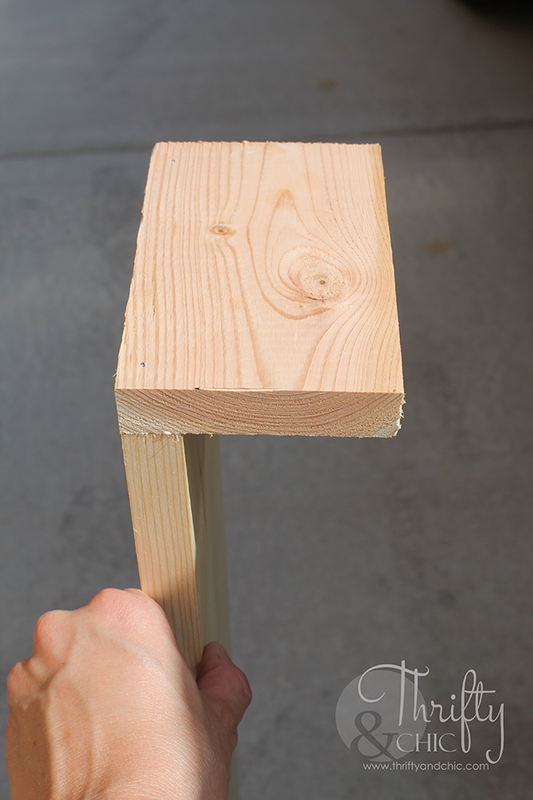 What is the different colored wood you used that makes the ends look darker after staining? Made these this week and absolutely love how they turned out - I feel like I have a brand new bathroom! Thanks for sharing! I have a question as to what measurements would be if you switched things to a 1x10. Seems like a lot of pieces would change in measurements and I'm having trouble figuring that out in my head. Thanks! 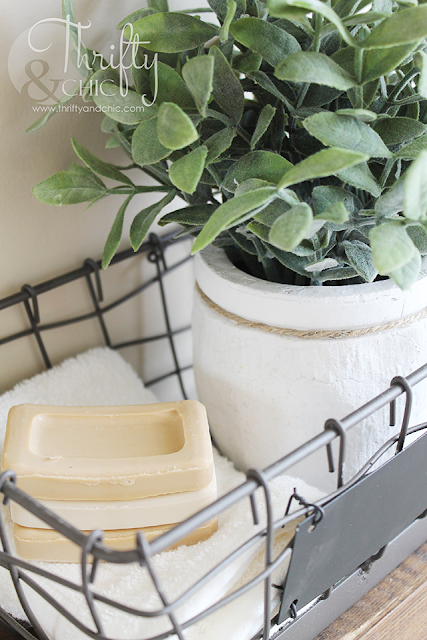 Hi where you buy the woven basket with the metal handle? I'd love to know where the other and filter are from. 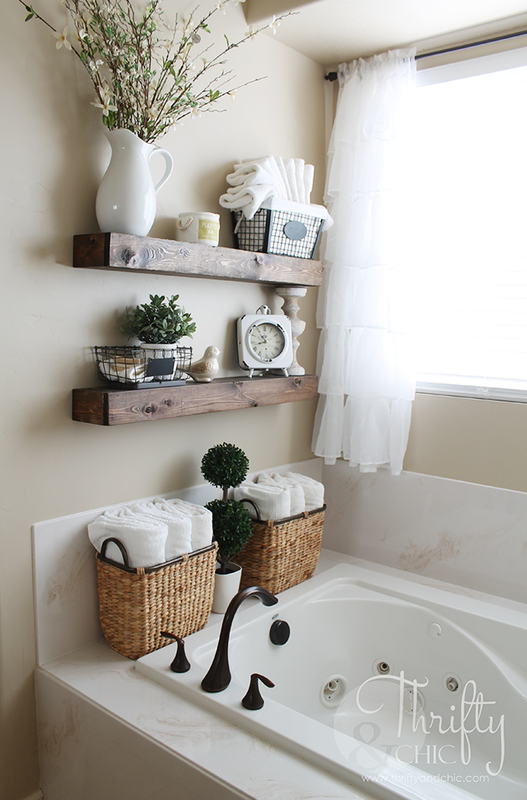 I want to try the shelves but also wanted to know what Brand and style is the Bathtub love it????? Thank you for this tutorial I think I can make it on my own and without waiting and waiting for hep. Thank you for sharing it. 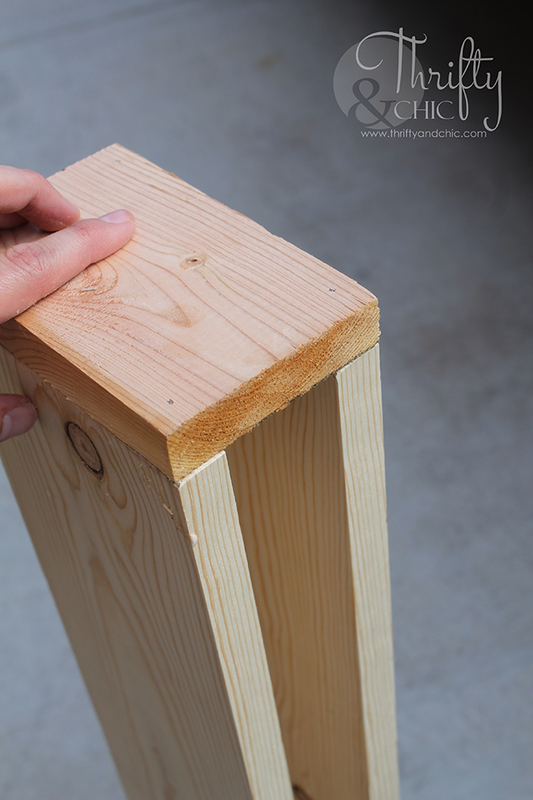 I realize this question is over a year old, but just in case someone from Pinterest wanders into the comments- - - I’m currently making these shelves and the problem Anon (above) is running into is the 1x6 she is referring to is a standard 1x6 board which actually measures 5.5” wide. Hence the 5.5” side cuts. All her measurements are spot on and my shelves are drying right now! Hope this helps someone else! Hi one question did you change the outcome/set up of the shelves? as one of the pictures near the beginning, shows the end caps on top of the end of the lengths, yet at the end photos you can clearly see the front length cover the end caps. No, it's the same. In the first picture you are looking at, it doesn't have the front piece of wood on it yet. That front piece will cover the two smaller sides. I mentioned it in the post that I didn't take a picture of the last step which is probably causing the confusion. Beautiful! Did you seal the shelves after staining with anything? No, I didn't. But for easier dusting, I would if I did it again. Also, I don't have a high amount of humidity in here so there's been no problem otherwise. If you happen to read this Alicia, just wondering where you purchased the baskets you put the towels in? Great tutorial! Thanks for sharing, I feel so empowered! !